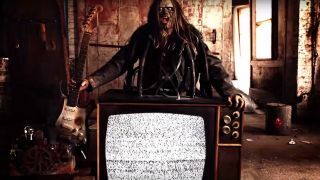 Rock and metal artists are contributing to an upcoming documentary detailing the relationship between music and horror. Titled The History Of Metal And Horror, the film features interviews with Alice Cooper, Metallica’s Kirk Hammett, Korn’s Jonathan Davis, Slipknot’s Corey Taylor, Doyle Wolfgang von Frankenstein, Chris Jericho, Wednesday 13, Anthrax man Charlie Benante, and more. A crowdfunding campaign has been launched to help the film’s production, with a target of $50,000 set with two months to go. The documentary will also feature icons from the world of horror, including Gunnar Hansen who starred in The Texas Chainsaw Massacre, and Night Of The Living Dead’s John Russo.